Your players can perform every injury prevention exercise and have perfect movement alignment, but if they are overtraining and unable to recover from their training, they may still get hurt. For this reason, it is important for coaches to learn simple ways to monitor overtraining and maximize player performance and recovery. As a coach, there are several important categories you should be aware of when determining if your players are overtraining: Player direct communication, body language, performance, psychological state, diet, sleep and stress. 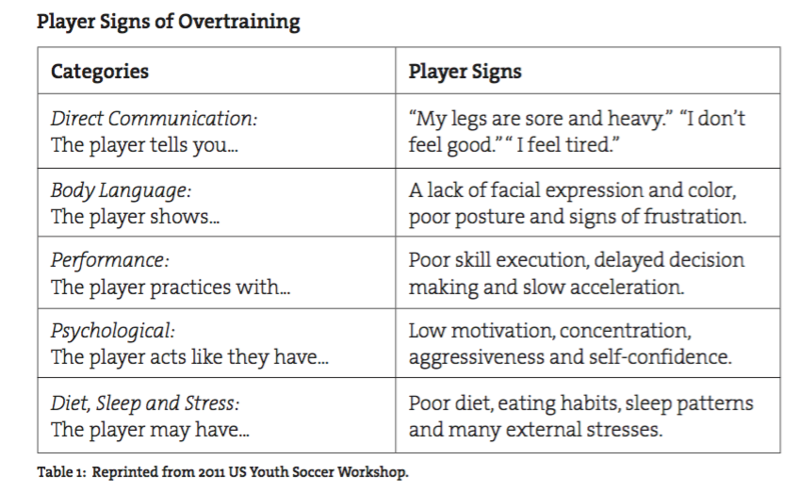 Overtraining can be a result of an individual player or the entire team’s ability to recover from a workload. There are four key overtraining errors that soccer coaches should be aware of that may lead to injury. It is much better to identify potential trends of overtraining ahead of time than to wait for players to present with warning signs. To identify dangerous trends in advance, players need to be routinely monitored. There are several options for coaches to monitor the daily or weekly status of each player. Coaches can utilize paper surveys, web-based programs or applications to track their players’ recovery and fatigue. Below is an example of a survey that you can give players to determine their readiness to practice and play. The survey is out of 25 points and contains the key categories that can affect recovery. 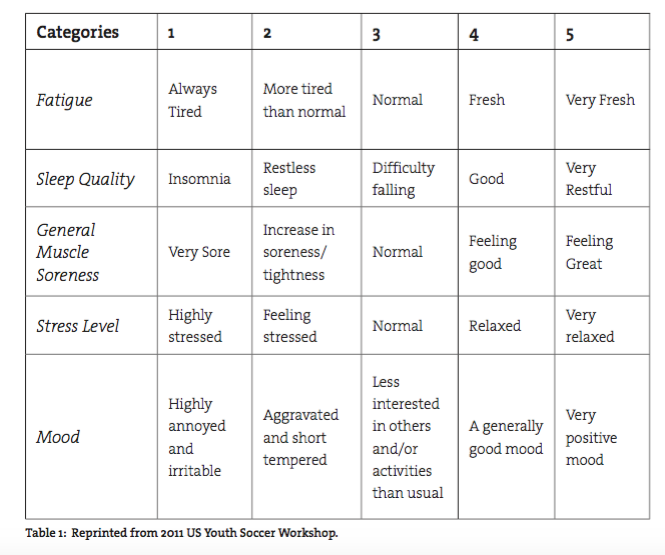 A score of 22 or lower indicates that the player may be experiencing overtraining or fatigue. 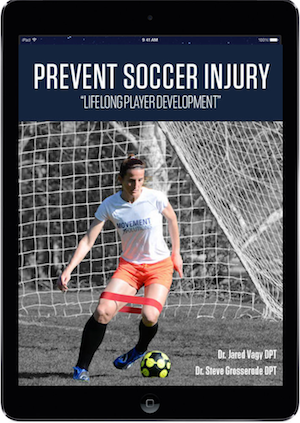 Prevent Soccer Injury: Lifelong Player Development. Visit yourmovementsolutions.com to learn more about how to prevent injury in youth sports and how to peak athletic performance without getting hurt.